Disclaimer and Warning: This article and video are certainly not for the squeamish or faint of heart. If this is you, then please close your browser now. 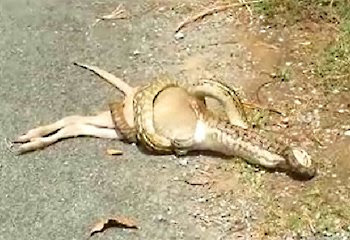 A python has been filmed trying to swallow a wallaby whole at a Cairns university. It seems that the large snake’s eyes were (as the saying goes) “too big for his belly”. In the footage (believed to have taken place at James Cook University), students can be heard squealing with fear as the python clamps its huge jaws around the marsupial and actually begins to swallow. It doesn’t take very long before the snake decides that perhaps it has met its match, and could be biting off more than he can chew. He is then forced to give up, and so regurgitates the upper half of the wallaby's body. Although snakes are predominately nocturnal, this is not the first time that a python has been seen on the campus during the day. Jim O'Brien, a spokesman for James Cook University said “"There are pythons, kangaroos and wallabies that live on the campus here. But it's the security guys who tend to see more snakes during the evening”. Other fascinating wildlife “battles” have been reported recently from Cairns, which is home to some of the world's deadliest animals. First a giant spider was photographed eating a bird, then a python was snapped devouring a sulphur-crested cockatoo. I think the students scared it too much. Probably coulda eaten otherwise.